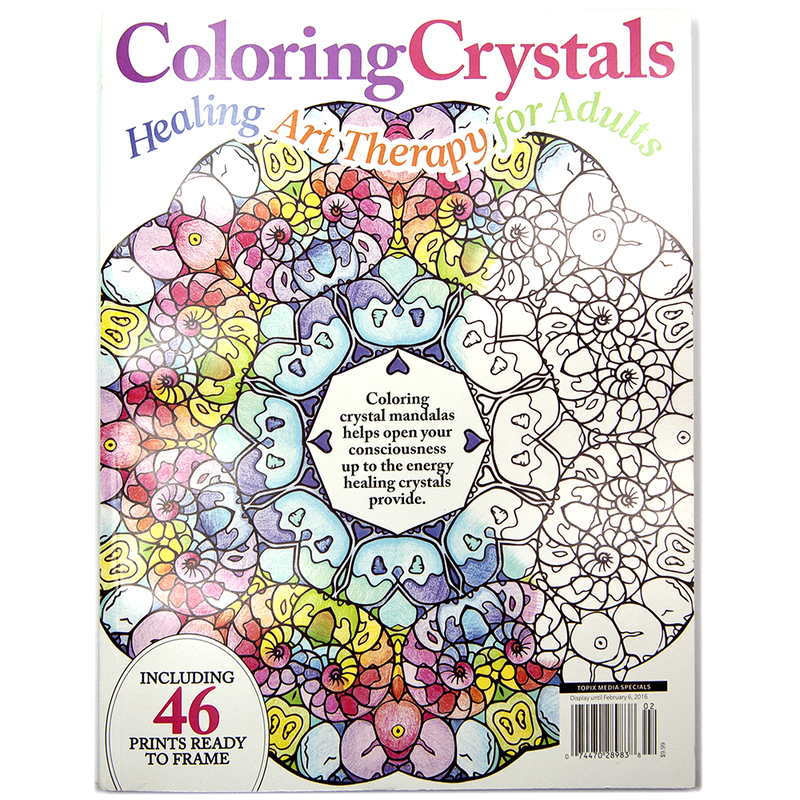 Our coloring books called Coloring Crystals and Chakra Crystals Coloring Book are available at your local newsstands, pharmacies, grocery stores and major discount stores (such as Walmart and Kmart). If you can't find them locally, you can get them HERE. Small children naturally love to reach out and use their artistic side and are constantly creating. Teachers and educators often talk about the many benefits that art has on small children and their development. As adults, many of us have lost some or all of this creative drive as we become busy with the daily grind. However, we can still benefit from taking some time for ourselves to stimulate our creative abilities and find our inner child. While a blank canvas can sometimes be intimidating, a coloring book or printout makes accessing your creativity more easily accessible, whether you have a couple hours or only a few minutes of free time. Before you break out the crayons and colored pencils, try charging your coloring book with crystals. I like to place a few crystals on top of the cover of the book overnight, if I can, but for at least an hour. Doing this will energize all the pages of the book with crystal energy, which you can benefit from while you are coloring. You can place crystals on your crayons, colored pencils, and paints too! My favorites to use for this are Orange Aventurine, to spark creativity, and Fluorite, for focus. You can also set these crystals next to yourself while coloring to energize your space and aura. Filling in all the little spaces of a picture with vibrant colors can also be a spiritual experience. Many people find it easy to enter a meditative state while performing repetitive acts that don’t take much analyzing or thought. Coloring and artistic creation can facilitate this mental state, allowing you to connect with your intuition and inner guidance. To encourage this enlightened state while using a coloring book, try keeping a piece of Lapis Lazuli or Selenite nearby. If you are hoping to work with the angelic realm while coloring, Seraphinite is a great crystal for this purpose. Coloring Mandalas are a great choice for this type of activity. Mandalas are geometric figures that often contain symbolism and usually have many small sections, which make them a great tool for a coloring meditation. Try playing calming music in the background to further boost the energy of the room. If you are looking to work with the energy of a specific crystal, working with a picture of the crystal can help with this. Gazing at photos or drawings of crystals connects you to the crystal’s energetic vibration and enables you to benefit from the crystal’s energy without having the actual stone in the room. A coloring book of crystals* or printing pictures from a website are a couple of easy ways to get pictures of crystals for coloring. Looking to attract more love into your life? Try coloring a picture of a piece of Rose Quartz with a pink pencil. The combination of the intention that is put into artistic creation, focus that is centered on the Rose Quartz, and the use of a pink crayon will all impact you and help to draw loving energies of these vibrations. Couldn’t we all benefit from more luck? Coloring a piece of Green Aventurine in a coloring book with a green crayon will help to increase your chances of good fortune. Our creative side is strongly connected to our spiritual side and psychic abilities. By doing activities that use your creativity, you are increasing the capacity of your spiritual growth and also raising your energetic vibration. If it has been a long time since you have opened your box of crayons, try a coloring meditation to add a splash of color and energy into your world.